The Buyer: Mr. Louie Swyden rose through the ranks in the apparel industry. He held executive positions at several well-known brands. Mr. Swyden’s extended family owned and operated a successful local dry cleaning business, giving him the dream to own his own business one day. 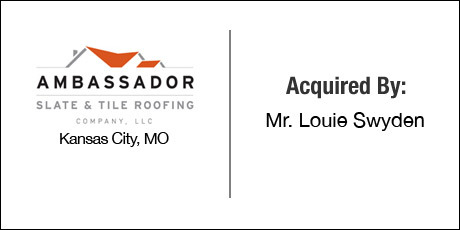 The Seller: For over fifteen years Ambassador Roofing has been a Kansas City leader in tile and slate roofing and repair. Ambassador specializes in slate, clay tile and concrete tile roofs. The Close: When Mr. Swyden approached the DVS Group he wanted to leave his executive position and current industry. He wanted to find a company that would take advantage of the managerial skills and experience that he had established in his career. DVS introduced Mr. Swyden to an affordable company with growth potential and to a seller who was willing to mentor him while he learned a new industry. DVS structured the deal that ensured that both parties would share in the upside of a successful company post-closing.